Australian Cattle Dogs - The Australian Cattle Dog (ACD), also known as the Queensland Heeler, Blue Heeler, and Red Heeler, is a herding dog developed in Australia for controlling cattle. It is a medium-sized dog with a lot of energy, intelligence and an independent streak. The Cattle Dog's coat comes in two basic colours (blue and red) and a variety of markings and coat patterns, sometimes quite striking. This information is licensed under the GNU Free Documentation License. It uses material from the Australian Cattle Dog article on Wikipedia.org. 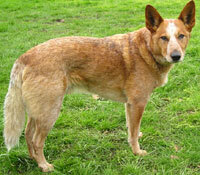 Australian Cattle Dog Breeders - Advertise your kennel puppies and dogs here.